You can remove one or more accounts for an institution that is connected to Tiller from the Account Summary area on the Tiller Console. What happens to the existing data in my sheet? If you remove an account that is linked to one of your Tiller spreadsheets Tiller will no longer pull data into this sheet for this account, but it will not remove any of the data for that account that already exists in the sheet. If you no longer want to see that data in the sheet, you’ll need to manually delete it. Acknowledge that you want the account to be removed by clicking “Remove Account” on the dialog that pops up to confirm you want to remove the account. The account will automatically disappear from the Account Summary and accounts list for each sheet. All data associated with that account will be removed from Tiller’s databases. Repeat steps 1 - 5 above for all accounts associated with an institution. Note: If you remove all accounts that are connected to your Tiller Console, the console will no longer display your Tiller spreadsheets. You must have at least one account connected to Tiller in order to access your Tiller spreadsheets from the Tiller Console. You can still access your Tiller spreadsheets from your Google Drive using these steps. 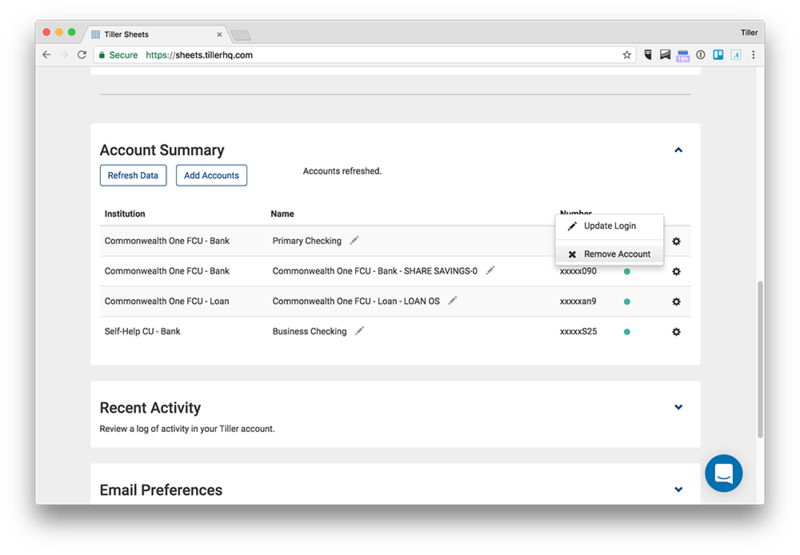 If you’d like to reconnect an account to your Tiller Console that you’d previously removed simply go through the Add Accounts process for that institution again and all accounts will be pulled back in. Note: If you reconnect an account that was previously linked to a sheet and then relink it to the same sheet you will get duplicate transaction and account balance data. 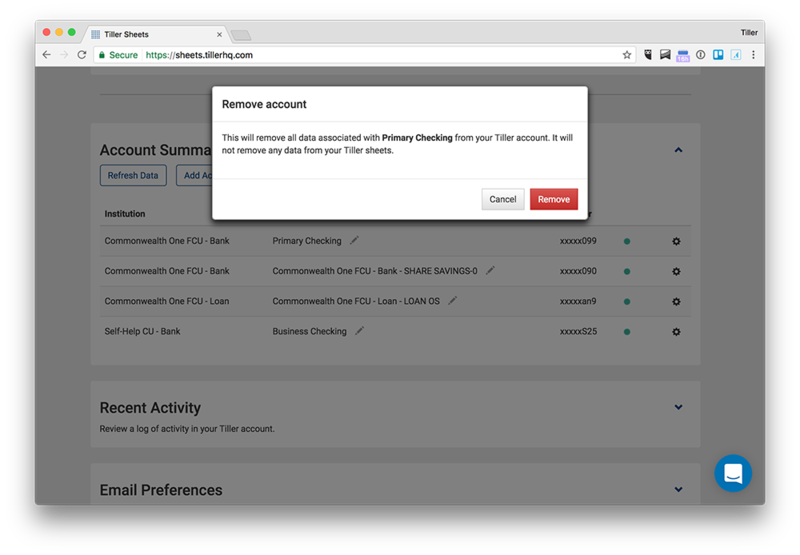 Tiller thinks that you’re adding the account for the first time so it will pull in all the data it can grab from your institution for that account.